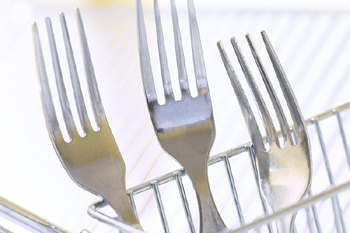 You can clean tarnished silver quickly and easily and without messy, smelly pastes. Fill a kettle with water and bring to a boil. While the water is coming to the boil put an aluminium baking dish in your kitchen sink (the disposable barbecue kind are ideal for this job, and it can be re-used over and over) and put the tarnished silverware in it. Sprinkle bicarb soda liberally over the silverware. Be generous and cover as much of the silver as you can. When the water comes to the boil pour in enough to completely cover the silver. It will bubble and fizz for a few seconds, that's OK. When the fizzing has stopped, check the pan - your silver will be sparkling up at you. If your silver is very tarnished you may need to repeat the process if necessary. A piece of aluminium foil in the bottom of the sink + handful of washing Soda (Lectric in Aust) does the same trick but more spectacularly. Put silver on top of foil - sprinkle with with washing soda & watch what happens. Unbelievable to see tarnish vanish before your very eyes. Each piece of silver should be touching another - magic!